Certified organic flower bulbs and corms, and flower bulbs and corms grown without synthetic pesticides or synthetic fertilizers, are difficult to find. As of 2015, gardeners have two choices. 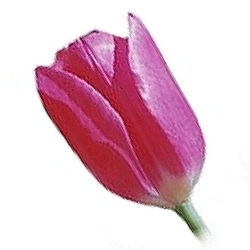 EcoTulips offers USDA certified organic bulbs. EcoTulips is the only USDA certified organic supplier for tulips, daffodils and muscari in the United States. They import their bulbs from certified organic (Dutch SKAL organic certification) growers in Holland and also have a farm in Rhode Island where they grow their own certified organic bulbs and flowers. Eco-Tulips currently offers tulips, daffodils, muscari (grape hyacinths), crocus and hyacinths. A few of the nurseries listed on the daylily page sometimes also offer bearded irises and Siberian irises that are grown without synthetic pesticides or synthetic fertilizers. Some of the nurseries listed on the perennials and ferns page offer lily bulbs. Product: A lovely selection of USDA certified organic bulbs, imported from certified organic growers in Holland or grown on their own certified organic farm. They offer tulips, daffodils, muscari (grape hyacinths), crocus, and hyacinths. While care has been taken to ensure the correctness of this information, I cannot take responsibility for errors or omissions. The presence of a nursery or supplier in the above list does not mean or guarantee that all (or any) of their seeds or plants or other products are certified organic or grown without synthetic pesticides or synthetic fertilizers. Always ask a nursery or grower for certification status and any other relevant information regarding their product. The images used on this website are not intended to represent plants available from any of nursery or supplier. This web site contains information gathered and posted by the owner, Judy Stouffer, who has no responsibility or liability for any problems arising from or out of its use. The data is provided for information purposes only. I have no affiliation with any of the companies listed here, nor am I a supplier or reseller of any products. I'm just a gardener interested in promoting sustainable and organic gardening and agriculture. The Tau Topics website, of which Bona Fide Organics is a part, has been viewed millions of times by visitors from over 140 countries since going online in March 1999. This web page was created and designed by Judy Stouffer, B.S. M.S.